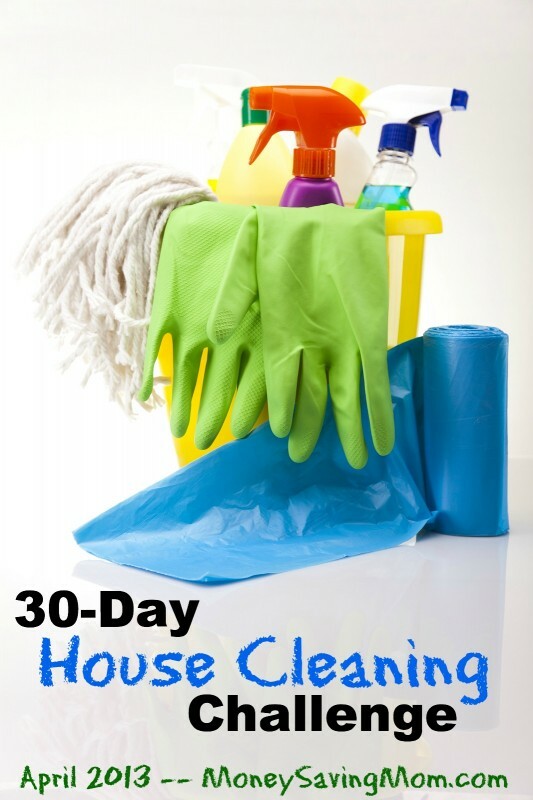 Join us for the 30-Day House Cleaning Challenge in April! April is around the corner and that means it’s time to start a new challenge here! 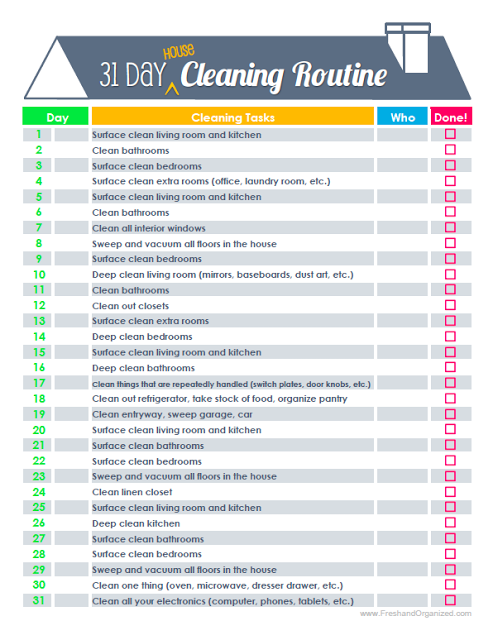 I debated about a lot of different things, but finally landed on the 31-Day House Cleaning Routine printable to use as a guide. ::Every week day morning at around 9 a.m. EST, I’ll post the daily project for you to tackle. We’ll be following along with this list from FreshandOrganized.com, but I’ll be adjusting it a little and simplifying some of the projects for you that might feel overwhelming or too much to tackle in a day. ::Every evening at 6 p.m. EST, I’ll post a check-in post with pictures of my accomplishments and a linky for you to post links to your blog posts if you’re blogging about the challenge. ::Want to blog about this challenge? If you’re blogging through this challenge with me, be sure to leave your link to your direct post on the daily check-ins. Plus, if you’d like to post your daily posts to the 30-Day House Cleaning Challenge Pinterest Group, just shoot me an email (moneysavingmom @ gmail dot com) and I’ll invite you. ::Want to follow along on Twitter or Instagram? I’ll also be sharing some of my cleaning pictures on my Facebook Page, my Twitter account, and my Instagram account. I’d love to have you do the same or join in the discussion on Twitter and Instagram. Just follow hashtag #Cleanin30 to see what others are tweeting and Instagramming about this challenge! Note: We will be taking weekends off. You can do the project on the list if you’d like. Or just enjoy the weekend off. It’s up to you! Leave a comment to let us know you’re planning to participate. The more, the merrier! Looking for more? Read more posts about 30 Day House Cleaning Challenge. I’ve just began to think about spring cleaning so this is perfect! I will try my best to join in April’s challenge. Thanks for sharing. I’m in! I know you are all about breaking things into manageable pieces, which I absolutely love. This is so perfect for me! I always feel overwhelmed when I think about spring cleaning. Yes, I think I want to join in on the fun!!! I am in!! I think I will blog my progress…a little accountability might help me stay on track! 🙂 I can’t wait to begin! I need this! I’m definitely in. These are my favorite kinds of posts from you. I’m excited to read about your homemade cleaning stuff. It sounds great! I plan to participate! Always looking to improve so sign me up 🙂 Maybe I will even develop a better habit or two. I was just thinking about making a plan. So excited to be joining you in this! I was just thinking about making a plan. So excited about joining this! I’m in! I’ve been trying to do a little each day just to stay caught up and not lose my weekend to routine cleaning, but I don’t feel like I get around to any of the deep cleaning often enough. It’s too easy to put off until later! I’ll be joining. As some other commenters said, I’ve been thinking of doing something so this is perfect. I’ll be joining! Would really like to see more deep cleaning than listed for a spring cleaning (grout, behind fridge&oven, washing curtains and blinds, dusting vents, all baseboards, etc..). Looking forward to the tips and tricks as well as natutal cleaning alternatives! I actually discovered your blog last year and I spent ages reading your story about how you got out of debt, how you got started blogging, etc….really enjoyed reading about your journey! I’m sorry, what I meant is how you avoided debt, etc. while your husband was going through law school..fascinating stuff! I had already been planning to do my spring cleaning starting next week. I’ve been getting all my ducks in a row for this. It’s Spring Break for us but we’re staying in town. I think I **HAVE TO** do this one!! Can’t wait! I think this is a great idea. Hopefully I can join with you and others and get my house clean since I do not have a whole day to dedicate to just cleaning. I usually do some spring cleaning this time of year so this challenge will be great. Sounds like a good one to try. I love reading your challenges, but I have never done one. I don’t have a blog, but I’ll try to keep up. I need some help figuring out what constitutes “surface cleaning”, “cleaning” and “deep cleaning”. I tend to get in over my head and then burn out quickly – I don’t feel like I have cleaned a room until every surface, every object, every inch of it has been scrubbed and that’s exactly how I get turned off of cleaning all together for weeks at a time sometimes! What would you clean, for example, when you surface clean your living room and kitchen — and what would you save for a “deep cleaning” day instead? I’m in. I really need this. I was swondering if there would be a spring cleaning challenge! I plan on joining you since I liked the last one so much. I will so be doing this. I need the motivation in the worst way! So excited about this I have been looking for some motivation to get my house ready for Spring and Summer! My kids are so into Sticker charts the print out will make it easier to get them involved. Sweep and clean floors happens at least twice a week here. I have three dogs. I am going to do this. Can’t wait. I’m totally in on this! I may even resurrect my blog, which I haven’t touched in forever. I love this challenge. THANK YOU FOR BRINGING IT BACK JUST IN TIME FOR SPRING! This is awesome! Just what I need! I am also using April to work on my grocery budget/ meal planning. Wow! Great minds must think alike. I just started a Facebook group yesterday to do a cleaning challenge for the month of April with one of my bloggy friends. We’ve had 34 ladies sign up so far. Can’t wait! Count me in! I need to get a handle on my Spring Cleaning! Now if this snow would stop falling, I could really get in the mood! Well, if all the cool kids are doing it, I guess I’d better. I am in!! I was just thinking about spring cleaning this morning and that I need to start on it. Love these monthly challenges. Count me in! Oh, me, me, me! Boy do I need some spring cleaning around here! Thanks for doing this! I’m in. I really need a jolt in getting my house clean. Hopefully this will be what I need! I think this is just what I need. I’m on board! Little nervous about feeling guilt when I don’t rise to the challenge…but I am excited about some motivation! I am in. I love a good challenge! Yes, I will be doing this! I’m still not completely unpacked from our move last August, so I desperately need to work on my organization! Definitely doing this! I need some motivation and accountability, so this if perfect. We moved into our new house 2 months ago and I haven’t made a cleaning schedule yet. Yay, love this! I participated in the spring cleaning last year and it was awesome. I’ve actually already started some spring cleaning, but have a lot more to do. This will give me more motivation! I am on board for sure! Still working on this month’s challenge. I haven’t been especially successful but I am still working on it. I’m in, at least as much as I can tackle can with my 3 month old darling son! Count me in! My cleaning routine (or lack thereof) needs this. I’m sooo excited about this challenge! I sure hope it warms up so I have some motivation. I’ve not done any of the challenges in the past, but my house needs this more than ever!!! I’m looking forward to your homemade cleaning recipes. I’ve been wanting to try more homemade/natural cleaning as I way to cut costs and reduce chemicals in our home. Sounds great! I’ve been reading the book “Desperate” that you recommended and this will fall right in line with the housekeeping part of the book. Thank you for doing this! I hope I can keep up with it! I planned on doing a spring cleaning series during the month of April. This is great! It will give me the guidance that I need. What a wonderful idea. I always need motivation for cleaning. I started spring cleaning a few weeks ago but I look around and its back to toyland tornado. Hopefully following along will help. This is exactly what I need right now! I’m in. I am in! This is perfect for me. I will be reporting my progress on my blog as well. Good luck to everyone who joins in the challenge! Perfect timing! I have been trying to get organized and get everything in order/cleaned up before baby #2 arrives. I’m in! I’m totally in! If the Spring Cleaning Challenge goes anything like this early rising challenge has gone for me, I may very well end up with the cleanest house on the block! I was really hoping you would do something like this for spring, So excited! I will definitely be participating. I have been telling myself (and my husband) for the past month that I HAVE to get myself motivated to clean the house from top to bottom. This April challenge is a perfect opportunity to get busy. Looking forward to the accountability that blogging about it will force me into. I just hope I don’t let myself down! Count me in! Finally a system that I think I can work with. I’m in! Thanks! With a crawling-everywhere baby, I really need to get my house in shape! Sounds GREAT! Looking forward to this! I have been off work this week for spring break and didn’t get a whole lot of cleaning done. This will definitely help me get motivated! This looks so much more manageable than my list of 20 million things I wanted to get done this week. I’m in! I’m in! It’s just the motivation that I need! How can you print off the list Crystal? (I’m not Crystal) I had trouble in IE viewing the page she links to (may just be me). So I opened it in Firefox, http://www.freshandorganized.com/2013/02/the-31-day-house-cleaning-routine.html then at the bottom of her picture is a link and you click on that. It opens a viewing page then at the top right there’s a blue button saying “Download”. Then I was able to save it, it’s a pdf file. This comes at perfect time! I will (time permitting) be participating!! So excited. I’m in! Our house is a mess! My family thanks you! As winter is dragging on in Wisconsin…. I am definitely getting the itch to clean the house from roof to floor! I’m in! I think blogging is a must for me so that I can see the progress being made. Super excited for this challenge! Love this! I’ll try it! Love this. I am so in! Hopefully I’ll be able to do some decluttering while I’m at it! I’ve been feeling a little convicted about this lately, I’m a young wife, no children, and only work 30 hours a week and STILL have a hard time keeping our house clean! I’ve got the cooking thing down pat 😉 but the cleaning part? Not so much. I’m excited about joining this series! I’m in! Can’t wait to see what my house looks like on May 1st! I’ll join! Although I’ll be starting a few days late. We are leaving for washington D.C. and returning a few days after the 1st. But I will surely start on in and catch up once I get home. I think I’ll even blog it. It will give me something to do. I’m in! I need some structure to get this house deep cleaned! I’m good at keeping it surface cleaned, just not on keeping up on the nitty gritty, you know? Can’t wait! This past January I started following FlyLady for home maintenance, and it is working better than anything I have ever done. At first I thought I’d never get anything actually finished with her “15 minutes at a time approach”, but now that three months have gone by and I’ve cleaned every room in my house three times now (once a month), I realize how well it actually works over time. There’s not a lot to do at one time if you do a little frequently. I used to clean like a crazy woman and then crash and burn, but now I’m just humming along slow and steady, with no need for a big “spring cleaning” project. Not trying to unsupportive of MSN (I love you Crystal!). Just mentioning something that is working really well for me. So excited to hear about how FlyLady is helping you — yay! Count me in! And I’ll post about it on my blog. Do you have a badge we can post to link back to your challenge here? I don’t have a badge, but feel free to use the graphic I made at the top of the post. Or create your own to use for your blog! I will do what I can, but I need to declutter many areas before I can clean them. Count me in! I SO need this kick in the pants challenge! I am totally in! My apartment needs some cleaning and purging! I will be joining this challenge! Love spring cleaning! Hi would love to join in for the challenge. I don’t blog, twitter or instagram so not sure how I will let you know how I am doing. Let me know if there is an alternative more low tech lol. This is exactly what I need. I’m 7 months pregnant and have strong cleaning urges but no cleaning energy by the end of the day. A little daily reminder to do a 15 minute declutter + a cleaning task will be great motivation. Will definitely be joining you – we have 6m old triplets so keeping our house, besides the necessary areas, clean is a challenge! I am ALL over this! Couldn’t come at a more perfect time … my house is in need of some major help! Yes!! I’m in the throes of my first trimester with our third, so I’ll do what I can! It’s been hard not being as productive as I like to be, but I try to remember the wonderful reason why. I’m loving this idea – I’m in! Can’t wait! I’m in! I’ve looked over some of those nice “seasonal” cleaning lists and I’ve, uh, NEVER done some of those things. Are there people who really do move their furniture twice a year to get rid of the dust and then move it right back to where it was? But Crystal, April 7 is “no housework day”. I am joining you on this 30 day challenge and I am Really looking forward to it!! Definately! Maybe this will get me motivated! Thanks this is just what I need to get me motivated to spring clean my house. I will be joining in the challenge . My house needs help! I am spring cleaning this weekend. My wedding is at the end of next month and the week after we are moving into a new house so I need to speed up the process a bit! Good luck to everyone! I am so in! I just printed out my list! I am ready for this daily house cleaning challenge. My house is ready for it too! It will help my stay on track with 2 of my goals: cleaning and blogging! This is exactly what I needed! Been THINKING about spring cleaning, but so overwhelmed with where to start, I couldn’t get past the thinking stage. This makes it so.easy and obtainable. I’m in! And super excited about it! Blogging about it will be great accountability! I’m in! This is EXACTLY what I need exactly WHEN I need it! I need this challenge. I am in but I don’t have a blog. I have fibro and my husband has recently been injured at work. I struggle to clean everything on my good days. I think that this will be great for us. I will be joining you. I am in need of plan, so this should be great! Great idea… count me in! Sounds great! I’m going to give it a try! I will try to keep up with everyone! Iam joining, I cant wait to get my hous in order!!! I’m doing this for sure!!! And linking it up to my blog. Neat! Here’s hoping I can keep it up. Cleaning my house is just about my least favorite thing to do, but I do want to provide an inviting home environment for my family so I am excited to join in and take advantage of the accountability and motivation this challenge provides. Here’s to a cleaner home! I want to join too! I can’t get the link for the list to work for me…it brings up a page, but shows only the background….anyone have suggestions? I’ve been trying to get into a better cleaning schedule, maybe this is what I need! I’m in! I love all of your helpful tips for every aspect of life. I’m eager to learn some new cleaning tricks to simplify my routine. i cannot get the list to even load on freshandorganized.com…the page will show up then it refreshes itself + then it goes to just the background, no text at all. i’ve tried it on a couple different computers…any suggestions? thanks! I’ll be joining you! I have three little boys at home and my husband and I both work full time. I need something to keep me on track! Thanks so much for all of your help. I love reading your tips and other money saving ideas. Woohoo! So excited for this challenge. I have clicked on the printable and it shows up on the page for just a second, kinda bumps around, and then disappears altogether! Is there a problem there or is it on my end? Never mind! I was able to print it from my ipad! Thanks! I will definitely be joining in! I’ll be joining this challenge. I absolutely love a clean and organized house!!! An Autumn clean for me and sounds good – just before we shut up for our Winter. I’m in! I have to get a better routine than the one I have. I am so overwhelmed with all the cleaning every day. The main living area in my home looks great, but please don’t ever go into my bedroom or bathroom! I have just got off from a 3 year spin with health issues. First Colon cancer – then back surgery for spinal stenocis, then hip replacement from a broken hip done from a fall, then just this Feb. right knee replacement….consequently my house has been neglected so I am in with you! I can do this – 1 day at a time! Definitely in! I need the challenge. Count me in too! My house needs it so bad! LOL! I will be participating! I’m getting my readers hyped up too! PLEASE make a day where I have to go threw my kids toys!! I’m having trouble printing the sheet though. I click the link and after a moment or two, the screen just goes blank. Any advice?? We are about to have baby #3 in our two bedroom townhouse… This is definitely the challenge I need!!! I’m joining, thanks for the encouragement. I can’t guarantee I’ll do it every day between working full-time and my daughter’s softball practice and games but I’ll do my best! I am definitely in. This is so needed in my home. I am looking forward to it! Planning to participate! Spring cleaning, here I come. Hoping I’m not biting off more than I can chew in addition to my fitness challenge starting tomorrow as well!! Sounds good! I really want to get into a good habit of cleaning a little every day and this will be fabulous incentive & accountability! I am joining you!!! I started following Flylady earlier this year and got off track. Hopefully this challenge will get me back on track!!! As much as I dislike cleaning I do like & enjoy a nice clean house! Not looking forward to the bedrooms but I will definitely be joining in on this months challenge. I am so excited to join this challenge, I have a blog I’m trying to start. However, I have no clue how to do anything like linking and stuff. Count me in 🙂 I will try my best to do it everyday, a challenge it will be. I will be joining in! I will be! I have a 1 1/2 year old and a 2 1/2 year old so I will be doing my best! Any cleaning is better than one! ok..ok… I hate house cleaning but I will give it a go cuz my house desperately needs help. Definitely joining in . . . I love the structured ideas to get me moving in my cleaning for spring! I’m in!!! I will be posting updates to my blog as well! Thanks for the encouragement! I’m in!! I’ve been looking for a way to get my house clean & organized that doesn’t seem so overwhelming. This seems simple enough & being part of the “group” will help keep me on track. Thanks!! I’m in but I have a question Do you do these on top of what you already do each day? IE. I vacuum and sweep every day if not a couple times a day. My mom told me last night that she want me too clean the living room, so I found this and the first day is tha living room 😀 So I’ll tell her that we should follow this challenge cuz’ our house is a really MESS because of the vacations, so I’m gonna start and when she come home I will surprise her! That is totally okay. Whatever works best for you! We’re glad to have you join us! I just started Spring Cleaning and I’m 6 months pregnant so the task seems daunting. This is just what I need, thanks! I’m needing this one big time! I can’t wait to see the results at the end of April! Going to do it too……but with the 3 year old tornado right behind me no one will be able to tell. LOL! at least I will know that I did it. Maybe some pictures as proof to show the hubby! I’m in! I need a little motivation and this looks like the place! Just in time for Spring Cleaning !! I’m in ! Coming in a day late, but count me in! I am in! I am blogging about it at http://www.lindalmartin.com, and am planning to post a list of 30 additional things that I am going to be doing this month to help spruce up around the house! Thanks so much for another great challenge, Crystal! I love and appreciate you and your blog so much! We are participating in this, Crystal! My girls are doing it with me, too. It makes spring cleaning fun. So glad to have you participating! I am joining…..thanks for the idea!!!! I’m a day late, but I’m in!! I am joining in on the fun. I’m in….got a slow start but will pick up…..any cleaning is better than none! I need to do this! My house is out of control! A couple days late getting started, but luckily I can catch up easy! Yay! Im actually keeping up! Hello, is it to late to join in the challenge? No way! Jump right in! Great! I am in! I followed this challenge last year and I was glad I did! I saw your picture of Saline solution. I read once in an Alexandra Stoddard book that you should always “decant” your mouthwash. I thought it was funny at the time. But I bought two decanters for @ $12 on Amazon. They do make a difference in how the countertop looks. Alexandra says too that there should always be someting yellow in a room and ceilings should not be painted white. Check her books out. I’m going to give this a shot but I might need to rewind to the top of the list when May 1st rolls around. Thanks for the list and the inspiration! Just the the motivation I needed. love a cleaning challenge. But also love some notice. Thanks for posting so far in advance. Can’t wait.